The Pipes of Christmas Rouse and Inspire! How It’s New York: Some of the best players in NY will be performing at the Pipes of Christmas in NJ and NY, including Chris Layer, who runs the Tuesday seisún at Swift, and is on this week’s podcast. And the company will play “Lament for the Lost,” commissioned in 2001, on the 10th anniversary of 9/11. How It’s (Irish)Scottish: Highland Pipes! Clairseach! Kilts! Clan Currie! But if you want some actual Irishness, Bob Currie offers explains that the Curries used to be the O’Dalys from Sligo, and fled Ireland after a bard killed a steward with an axe (full story below). There are Irish Christmas gigs all over town (and I’m not knocking them, see my piece on Mick Moloney’s Irish Christmas at Irish Arts Center)– but Scottish Christmas is more of a rarity. 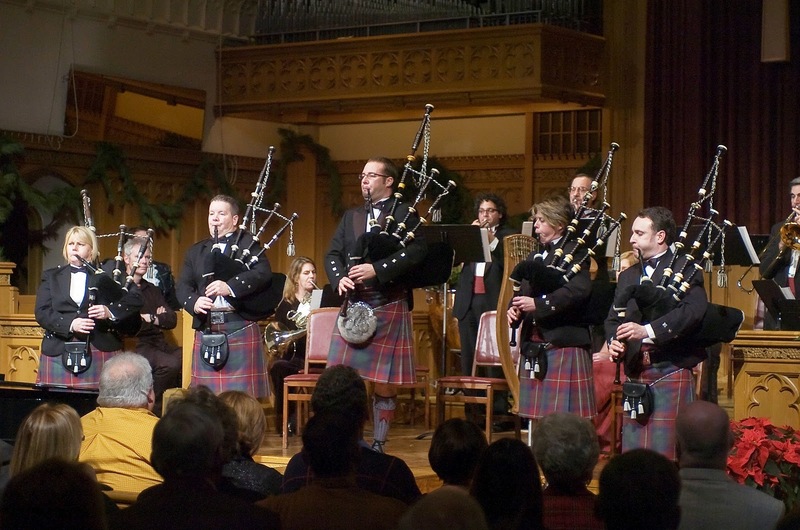 So you won’t want to miss The Pipes of Christmas this weekend. Put on by the Clan Currie Society, it’s a rousing concert that mixes piping, harp music, readings, fiddle– and tickets support a music scholarship program hich includes annual gifts to the National Piping Centre and the Royal Conservatoire of Scotland (both located in Glasgow,) the Gaelic College of Nova Scotia and Lyon College in Batesville, Arkansas. Though there’s a definite Scottish flavor (heck, Oban Single Malt Scotch Whiskey is one of the sponsors!) there will also be some content from Ireland and Wales. Featured performers include Andrew Weir from the film “Braveheart,” fiddle champion Paul Woodiel, “Riverdance” piper Christopher Layer, Gaelic Mod champion harpist Jennifer Port of Golspie, Scotland, and the Pipe Major Kevin Ray Blandford Memorial Pipe Band of Redlands, CA. You can hear them on this week’s podcast! For 2011, the concert will also feature a moment of remembrance for the 10th anniversary of the 9/11 attacks. “Lament for the Lost” will be performed by Pipe Major Scott Larson. Immediately following, the concert will segue into another beautiful piece of Scottish music with strong 9/11 ties. “Angels from the Ashes,” composed by Blair Douglas (from the Isle of Skye), formerly of the popular Scottish band Runrig. Douglas wrote and recorded the piece as a fundraising vehicle for Glasgow – The Caring City (GTCC) to help GTCC raise funds to send care teams to work with the children of the NYC Fire Department and Port Authority Police officers who lost their lives on 9/11. In subsequent years, the continued success of this effort has meant that children and mothers of the departed have had the opportunity to enjoy holidays in Scotland as guests of GTCC. Pipers from the New York Police, Fire and Port Authority pipe bands have been invited to perform with the company. A portion of the proceeds from the concerts will be donated to the National 9/11 Memorial and Museum. Madison Avenue Presbyterian Church, located at 921 Madison Avenue (at 73rd Street) on Saturday and Sunday, December 17 and 18 at 2:00 PM. The Clan Currie Society is also the Title Sponsor of the annual National Scottish Harp Championship of America. AND NOW: How the O’Dalys Became the Curries! been well document back to Conn of the Hundred Battles in 177 AD. O’Daly was staying at one of the homes of the chief of the O’Donnells. Currie was actually started by an axe murderer. to Donald of the Isles, the namefounder of Clan Donald. MacMuireadach, later MacMhuirich and finally Currie.